OCEAN ACIDIFICATION and its impacts have received a lot of attention recently. Yet chances are, you’ve probably not given a lot of thought to acidification of freshwater. Or, for that matter, thought much about its impacts. You’re not alone. Compared to ocean acidification, there are considerably fewer studies. But that’s changing. One such study, published in Nature Climate Change, suggests that juvenile salmon could be affected by the acidification of their freshwater ecosystems as well as of their ocean ecosystems. Acidification is the common term for what happens when carbon dioxide from fossil fuels dissolves in water, lowering the water’s pH. Acidification of oceans and estuaries—called ocean acidification or just OA—has been widely shown to harm sea life, especially shell-forming creatures. The recent study’s researchers, led by Michelle Ou of the University of British Columbia, systematically evaluated the effect of elevated pCO2—that is carbon dioxide (CO2) dissolved in water—on juvenile pink salmon during the early stages of their freshwater development as well as during their initial introduction to seawater. Salmon are anadromous, meaning they’re born in freshwater and swim to the ocean to fully mature before heading back upstream to spawn. At least for pink salmon, the species Ou and colleagues chose to study, the fish are potentially vulnerable to low pH waters in both the streams where they hatch and in the ocean. This, via a series of lab experiments, is essentially what the researchers found. To mimic their subjects’ early anadromous lifestyle, starting two weeks before hatching, the researchers had their pink salmon juveniles spend ten weeks in freshwater tanks. This was followed by two weeks in seawater tanks. During both of these periods different groups were subjected to different levels of pCO2 meant to mimic present and future (that is higher) pCO2 levels projected under climate change. For instance, the control group was subjected to freshwater and seawater representing present day pCO2 levels. Another group spent its freshwater time in present day conditions and its seawater time in future conditions. Still another group spent both its freshwater and seawater time in future conditions. The researchers found that fish reared in the higher pCO2 freshwater treatments were significantly smaller than control fish. Furthermore, after being transferred to seawater, fish transferred to high future pCO2 conditions experienced stunted growth compared to those in the control. Fish transferred to the higher pCO2 seawater treatments also experienced lower maximum metabolic rates, meaning their ability to expend a lot of energy to migrate to sea, forage, and escape from predators was diminished. What’s still more interesting, fish reared in higher pCO2 freshwater treatments were less responsive to alarm cues, representing a diminished ability to detect danger. Instead, in Curious George fashion, they spent more time near novel objects, representing increased boldness in the presence of potential predators. To further test this finding and tease apart the role pCO2 plays on fish behavior, the researchers dosed their fish with a drug designed to block inhibitory signaling in the brain. Drugged fish that experienced heightened future levels of pCO2 appeared to return to normal, cautious fish behavior; drugged fish experiencing present day pCO2 were properly freaked out (our terminology, not the researchers’). This double whammy of diminished size and a preference for novel experiences compared with cautious, predator-avoiding behavior makes pink salmon juveniles, and hence the species, especially vulnerable to future, heightened levels of pCO2, the researchers conclude. Add to this study the findings of others noting still more climate change-induced punches—high stream temperatures and climatic factors such as Pacific climate variability—the Northwest’s culturally and commercially important salmon species are in for some rough waters. Citation: Michelle Ou, Trevor J. Hamilton, Junho Eom, Emily M. Lyall, Joshua Gallup, Amy Jiang, Jason Lee, David A. 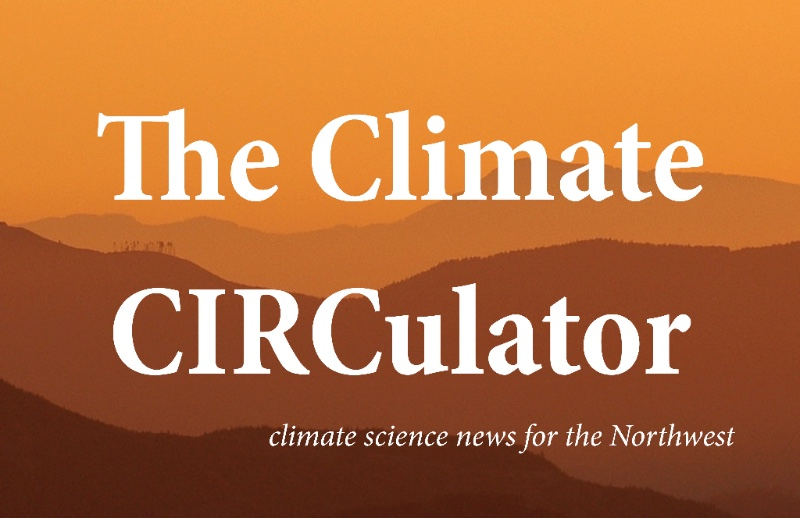 Close, Sang-Seon Yun and Colin J. Brauner, Responses of pink salmon to CO2-induced aquatic acidification, Nature Climate Change 2015 5 950-955; published ahead of print June 29, 2015, doi: 10.1038/NCLIMATE2694.